Whilst hirsutism itself is not a serious medical condition, it may well be the symptom of an underlying cause for concern, especially in those who develop hirsutism some time after puberty. ​This article gives a brief explanation of hirsutism, possible causes and how it is measured, an outline of how electrolysis works for hair removal and looks at 2 medical studies concerning the use and efficacy of electrolysis for hirsute women. ​Prior to puberty, the human body is covered in very fine, vellus hair. This is replaced during puberty in certain parts of the body by thick, long, darker hair known as terminal hair. This is due to increased levels of androgenic hormones, which control the development of male characteristics. Typically, men will develop terminal hair in more areas than women but in hirsute women, this is not the case. Hirsutism, the excessive hairiness of women following a male pattern of body hair e.g. on beard, chest or back, can have psychological effects which can be devastating to a woman's confidence and self-esteem. ​First published in 1961, the Ferriman-Galway Score is the method used to evaluate and assess the level of terminal hair growth in hirsute women. The terminal hair growth in each area is rated on a scale of 0 - 4. Each area has its own specified definition on the scale. The sum of the scores determine the level of hirsutism. For the purposes of this article, the most important point to note is that, if you are a woman with unusual and excessive hair growth you must seek proper medical advice from your physician prior to any hair removal treatment being considered. Polycystic Ovary Syndrome (PCOS), the most common cause of hirsutism, is a hormonal imbalance caused by a combination of genetic and environmental factors. ​The main symptom of PCOS is usually the appearance of small and multiple cysts on the ovaries, but this is not always the case. The other main symptoms of PCOS (apart from hirsutism) are:- irregular periods, weight gain / difficulty losing weight, insulin resistance and acne. There are, in addition, a number of other possible underlying conditions leading to hirsutism, all of which require proper medical tests and diagnosis by your physician. Prescribed ​medication can be used to treat the symptoms and redress the hormone imbalance causing the hirsutism e.g. oral contraceptive pills containing antiandrogenics or topical creams. ​In addition, hair removal methods can be used to treat the area to improve cosmetic appearance. There are a number of options, and which is best and most appropriate for you can be discussed with your physician and dermatologist. Briefly, there a 3 types of electrolysis; galvanic, thermolysis and blend (a combination of the other two). Electrolysis, whatever the method, works by passing a small amount of energy into each hair follicle via a very fine needle, in order to disable the follicle, and cause the hair to fall out. In a nutshell, the difference between the galvanic method and thermolysis is that galvanic uses electrical current, whilst thermolysis uses radio energy. Does is Work for Hirsutism​? Evidence supports the use of electrolysis for permanent hair removal in localised areas, with repeat treatments achieving from 15% - 50% permanent hair loss. This first study, carried out by the Dept of Dermatology at Indiana University School of Medicine, reviews and summarizes current evidence evaluating the efficacy of various different treatments used for hirsutism in pre-menopausal women. ​The method used involved searching online databases to identify all available reviews, meta-analyses and recently published randomized controlled trials (RCT's) relevant to the subject. ​As a result, four RCT's, one meta-analysis and one systematic review/treatment guideline were identified for inclusion in the study. "Physical modalities and oral contraceptive pills (OCPs) remain first-line treatments. Evidence supports the use of electrolysis for permanent hair removal in localized areas and lasers (particularly alexandrite and diode lasers) for permanent hair reduction." The study concluded that risks and benefits of all treatments should be carefully considered and discussed and patient expectations appropriately set. It was further concluded that a minimum of 6 months is required to see benefit from pharmacotherapy and lifelong treatment is often necessary for sustained benefit. ​This second study was carried out by Withington Community Hospital , Manchester , UK and compares electrolysis with intense pulsed light (IPL) treatment for facial hirsutism. Twenty-five women were enrolled in a split face study. Each had a series of 6 treatments with one half of the face receiving electrolysis and the half, IPL. Evaluation respecting reduction in hair counts, side effects and discomfort during treatment was made. Re-growth was assessed at 3, 6 and 9 months following treatment. 24 of the subjects expressed a preference for the Intense Pulsed Light treatment. 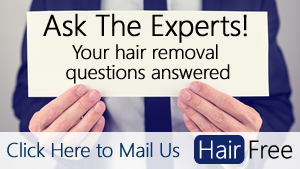 They rated their average hair reduction with IPL as 77% after five sessions. The overall patient satisfaction rates using visual analogue scales were 8.3 out of 10 for IPL and 5.4 out of 10 for electrolysis. In conclusion, it is fair to say that available written evidence including the two studies outlined, although limited, does support the use of electrolysis for hair removal. as part of a larger treatment programme, for small, localized areas. ​Any treatment will be long-term and probably lifelong. ​What are the different types of Electrolysis?